With the steady rise of the Passivhaus building system, we are being treated to some brilliant new ideas on how to design to the standard. Architecture Firm Karawitz designed this home in Bessancourt, France that hides a wealth of design details within a very traditional rural farmhouse form. The first thing you may notice is the shuttered bamboo skin and the solar panels on the roof — take a step inside and a modernist, high-craft sensibility takes over. Beauty is much more than skin deep, as the house is the first to receive the Passivhaus certification in the Ile de France region. Good green building starts with orientation, so this home is closed to the north and has most of its triple-pane windows facing south. The unique bamboo screen protects the home from intense sun and provides a veranda. 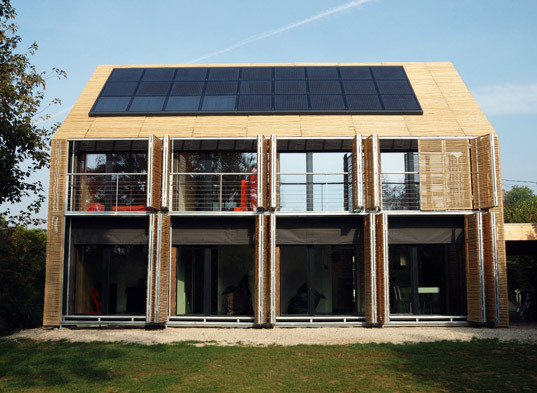 A solar-electric system and bamboo roof complete the exterior. The windows and prefabricated walls are so well insulated that the home’s primary sources of heat are the occupants and the sun, and a heat recovery ventilator provides fresh air. The basic shape of the home helps it not just blend into the neighborhood but lowers the exposure of the outside walls and reduces thermal bridging at corners, a notoriously difficult area of a building to detail. The real fun begins inside — at play is a wood-clad ceiling and walls, straightforward flooring, modern lighting, and built-in treatments. The simplicity and honesty in materials translates well with the raw concrete floor downstairs and the plywood floor on the second story. A circle motif runs throughout the home, adding a welcome visual texture to the boxy interior (merging wall details, for instance, with the bathroom amenities). 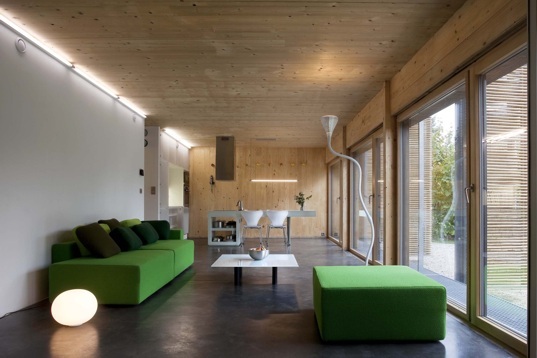 With such great design this Passivhaus looks to have a promising future as inspired inhabitation. With the steady rise of the Passivhaus building system, we are being treated to some brilliant new ideas on how to design to the standard. Architecture Firm Karawitz designed this home in Bessancourt, France that hides a wealth of design details within a very traditional rural farmhouse form. The first thing you may notice is the shuttered bamboo skin and the solar panels on the roof -- take a step inside and a modernist, high-craft sensibility takes over. 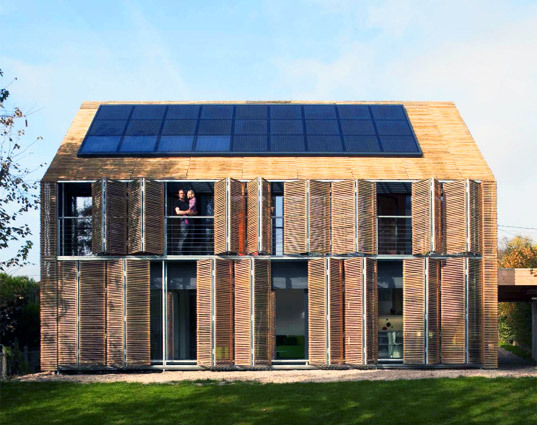 Beauty is much more than skin deep, as the house is the first to receive the Passivhaus certification in the Ile de France region.